Need Help Fixing Your Google Business Listing? 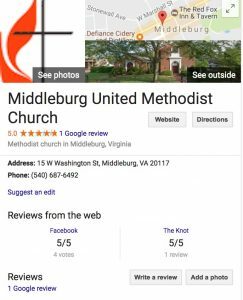 The Middleburg United Methodist Church was referred to me recently for help correcting their Google local listing. The problem began when the church created a new website for itself with a new domain name. The church website’s original domain name (middleburgvaumc.com) was never redirected to the new domain name (middleburgunitedmethodistchurch.org). When the church failed to renew the original domain name (assuming they no longer needed it because they had a new website) someone else purchased their original domain name. 1. Linked to the outdated incorrect website. 3. Displayed the wrong name for the church (Asbury Methodist Church). While the correct church website link displayed further down the page, most people would click on the first listing and then be confused. 1. The church did not have a gmail address, so we set up a gmail address for the church. Note: Since this article was published, Google+ has been replaced by Google My Business – business.google.com. 3. Using the church’s gmail address, we logged into plus.google.com, navigated to the Google+ Local page for the church, and clicked “Manage This Page” where prompted to do so. added church hours in the hours of operation section. 5. The church’s new website had a dead link to the church’s Facebook page. Since the church’s Facebook page provides another link to the church’s website which helps confirm and reinforce the correct website URL, we fixed the dead link to the church’s Facebook page in the website footer. The final step in correcting the church’s Google+ Local listing was to get the listing verified by Google. Fortunately, Google allowed phone verification for this listing. (Often, Google does not offer the phone verification option and will only verify a listing by sending a postcard to the listed business address.) Phone verification is immediate and can save a week or more waiting for the Google postcard to arrive with the PIN number needed to verify the Google+ Local listing. Although the Google+ Local listing was updated on a Saturday, we had to wait until the church secretary returned to the office on the following Tuesday to receive the phone call from Google with the Google verification PIN number. Once the secretary was in the office, the verification process took just a couple of minutes. First, I logged into the Google+ Local page using the church’s gmail address. Next, I navigated to the Church’s Google+ Local page and clicked “manage this page.” At the top of the page was a message stating that the page needed to be verified. I clicked “Verify this page,” and then followed the prompt to have Google call the church office. I called the church office from my cell phone and instructed the secretary to have a pen and paper ready to write down the PIN Number that would be provided by Google when they called. Then I clicked “call now”. Google called the church office immediately, the secretary wrote down the PIN number, told me the PIN number, and I entered it into the designated box on the Google+ Local page, then clicked “verify”. 1. When creating a new website for your business or organization, have a plan for moving the new website onto your original domain name or redirecting the original domain name to the new domain name. 2. Make sure your Google+ Local page is set up and all business information in that page is accurate and complete. 95% or more of all online searches for local businesses and organizations are conducted through Google, so it’s essential that all information about your organization in Google is accurate and complete. 3. Check your online listing score at Moz.com/local and follow the instructions there to complete and correct all other online citations / listings for your business or organization.